This will be a great western pleasure gelding after his halter debut. This gelding is big and pretty with a face that will look awesome in a bosal. He can show in halter in the Region 12 spotlight program as a yearling and two year old and then 3 years in the program under saddle. Jaipur El Perseus is by Perseus El Jamaal ( Ali Jamaal x Perfectshahn SRA ( by Bey Shah) and out of Lenita Peroy's prized mare, Jullye El Ludjin ( Ludjin El Jamaal x NV Justa Dream ( by Bey Shah). 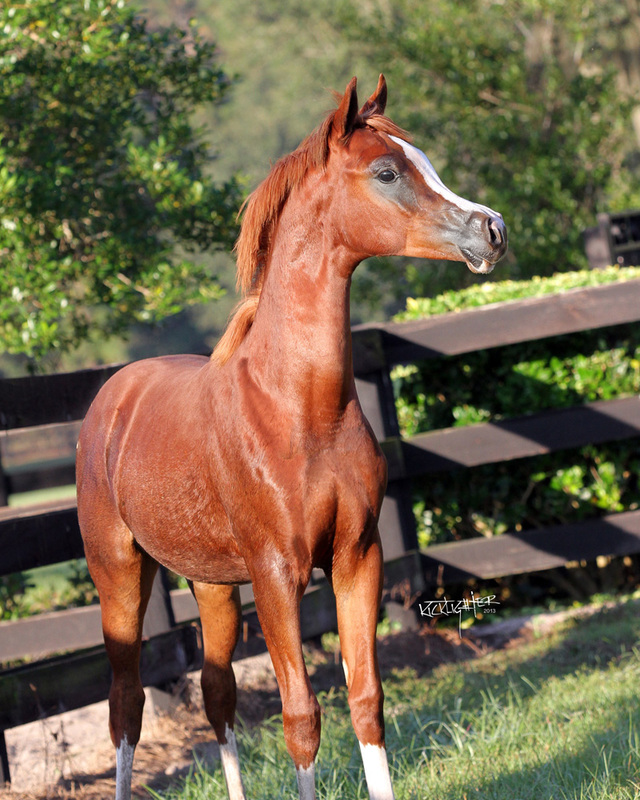 Jullye is the dam of the renowned Varian Arabians stallion, Jullyen El Jamaal. Azuro’s dam, BHF Anna Tevkah (Bey Shah x Tevkah) is the dam of Anna Marie BHF (by Marwan Al Shaqab) owned by Anthony Marino. Anna Marie BHF is a multi-champion halter mare in 2012 she was the US National Champion Mare AAO, in 2011 she was US Reserve Ch. Mare aged 4-5 and US Reserve Champion mare AAO. She is also the dam of Firestorm BHF (by Falcon BHF) – 2007 US National Champion futurity gelding in hand and the dam of Righteous BHF (by Falcon BHF) the 2011 US National Champion Arabian Futurity gelding in hand. **** this is a Scottsdale Signature Breeding, and Region 12 Spotlight auction breeding.